The draw has been done for the Summer knockouts. 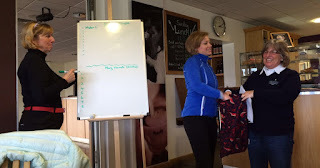 We did not have Gary Lineker and Sky Sports but went one better with our Golf Development Professional, Jo Oliver making the draw. Full details in the locker room - good luck ladies. The final of the Scratch Cup takes place on Monday between Kathy Dale and Lauren Pitcher. Good luck to both. I am sure it will be a cracking game. Just hope they are teeing off early enough in case they go down the 19th, 20th 21st... They will have until about 7.30pm because the clocks spring forward. Captains Drive In - Saturday 8th April - Still a few tee times left to come along and support your Captains. Good luck to the Pearson Team who resume their matches this week at home to Moor Park on Wednesday. Maria Moore Milennium Bowl will take place on Thursday. In very very blustery conditions seven hardy ladies played in the last round of the Ken Bird Winter League. Highest place went to Lesley Bonser with a credible 32 points finishing 27th . In the OOM Pat Ward pipped Linda Brown to top spot. American Foursomes this week so decisions to be made on which ball to take. Runners up with 34 points, Pauline Humphrey & Liz Cooke but with a magnificent 43, forty three points were Lesley Bonser and Hazel Brunnen. A swirling wind that never seemed to be to our advantage did not stop an almost full field competing in the March stableford. CSS was 75. Div 1 winner Kathy Dale with 31 points. Div 2 winner Mary Harrison with 34 points and the only handicap cut. Well done. 9 hole winner Pat Pollendine with 14 points.